No, but I've got three that I'm going to have to disassemble to rebuild. I can make notes of the assembly, then. The 8-5-28 parts book shows this one. Mine obviously needs new leather(s). Does anyone offer the parts separately? Just a cursory look in one of my catalogs showed a rebuild kit with everything except the base and tube. That's a bunch of stuff to buy when you only need the leather washer and a hose. Looks to me like ordinary 1/4" rubber hose from the hardware store will work. Our old traditional hardware store sold pump leathers, but I haven't tried the new place. I may end up going to the local boot & saddle shop for that. I wondered about making one, but in another hobby of mine, antique outboard motors, some Johnson carbs have a priming pump that uses leather cup washers. There is one guy who makes them. He says, go ahead and try to make your own. Says it's not as easy as it sounds and he went through many many iterations before finding a workable combination. I just took his word for it and bought them from him. These are pretty small. One for a tire pump might not be as fussy. I've made the leather cup out of a scrap of shoe leather. Just cut a circle about 1/2" diameter larger then the inside diameter of the tube, oil it up so it is pliable, assemble on the rod and stuff in in the tube. Mine has worked fine for decades. While you are all on pumps, i recently picked up one that i am not familiar with. 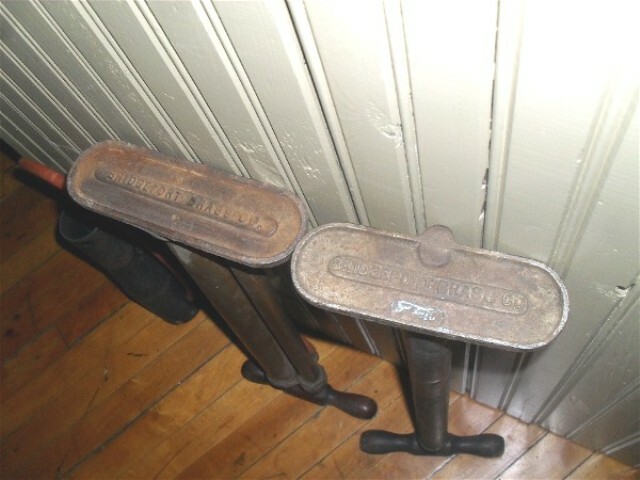 It is a couple of inches shorter than the common brass barrel pump, and the cast iron base only has one large ford script. 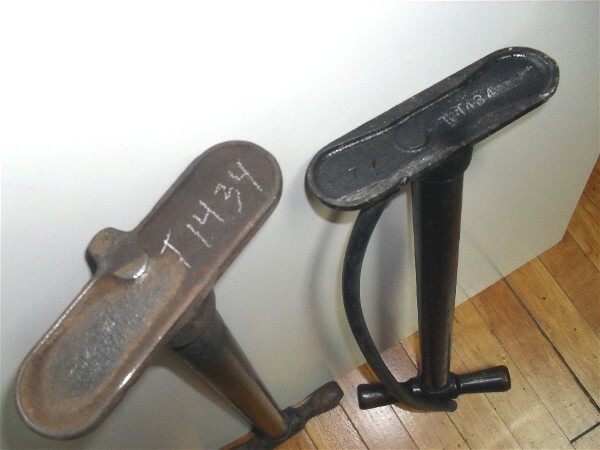 Same T #part number under the base casting. All black with a steel barrel. I can send pictures for posting to someone smart enough to put them on here. thanks! That's the pump they went to after the single barrel brass one. Hard to find. They carried it over to Model A,and changed the number. thanks jack ! i knew you would knew ! i'll still send pics for posting. 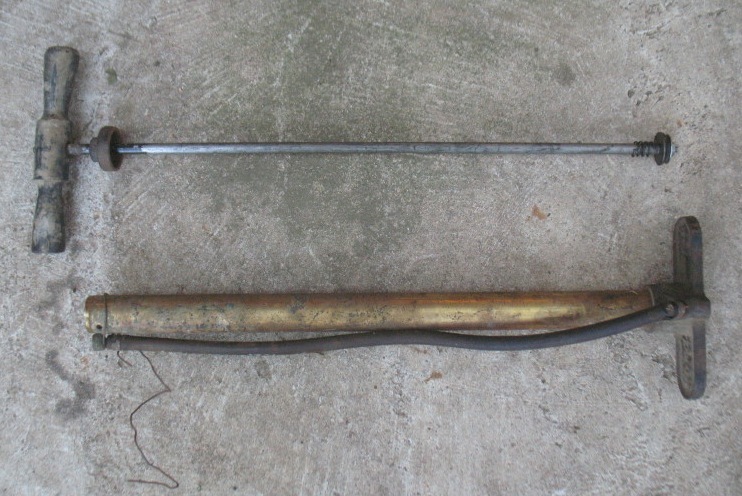 I have a ford script pump with a dent in the brass tube. Is there a source for a replacement tube? 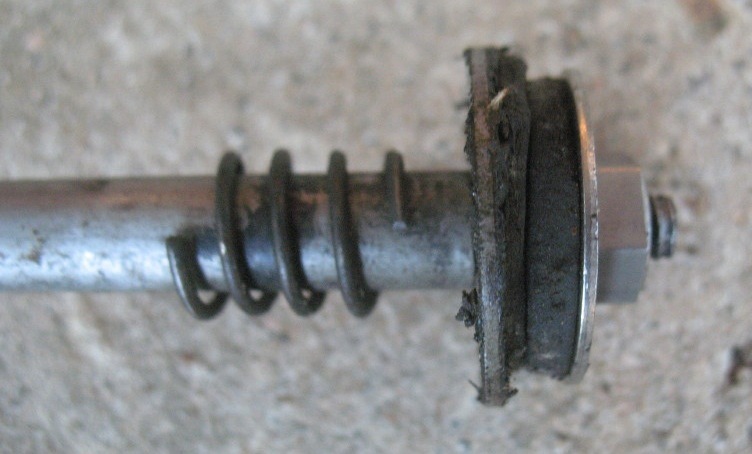 Does anyone know what the thread pitch is on the tube is? I might be able to make one on a lathe if I knew what the TPI was. Chester: Try a shop that repairs musicial instruments. 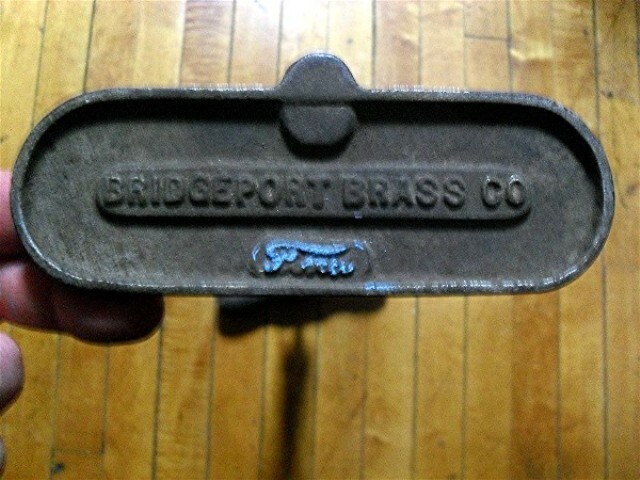 Some of them can do wonders with brass. You can measure the thread pitch with a gauge. Every good mechanic needs a thread pitch gauge. This is especially true with really old stuff like a Model T because not all pitches are standard. If you don't have a gauge sometimes you can find a standard bolt or a tap with the same pitch to determine an unknown pitch. I think it is a common plumimg thread. Problem is finding new tubing. Does anybody know what is correct for a june 24' touring would be? I recently used a soft piece of soft leather. I flattened out the old leather then found an impact wrench of the right diameter, then just used a sharp knife to cut it out. As for the hose; just go to a go bicycle shop and pickup the parts. I rebuilt a late pump recently, and I got the leather from Clay. I'll betcha he gets them from a local farm supply for $1 each! I found a piece of conduit slides down inside the tube just right to straighten out those dents, and costs around $3. Just round one end some so it will slide down into the dent. Use a rawhide mallet to work the dent as you go. The hose is available from Langs. 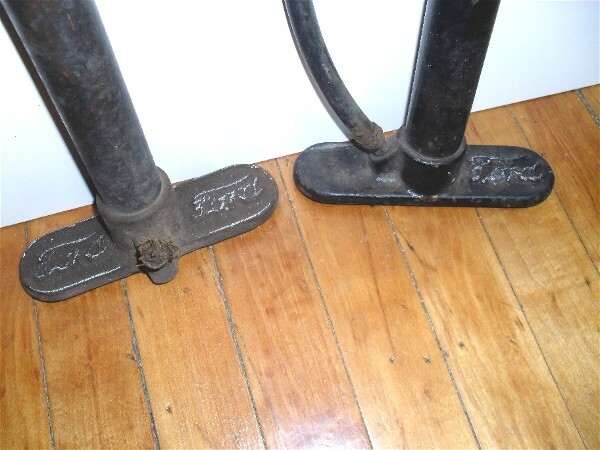 I was able to transfer all the original fittings from the original hose to the new hose. The new hose isn't quite as stiff as the original, but works, and looks right. 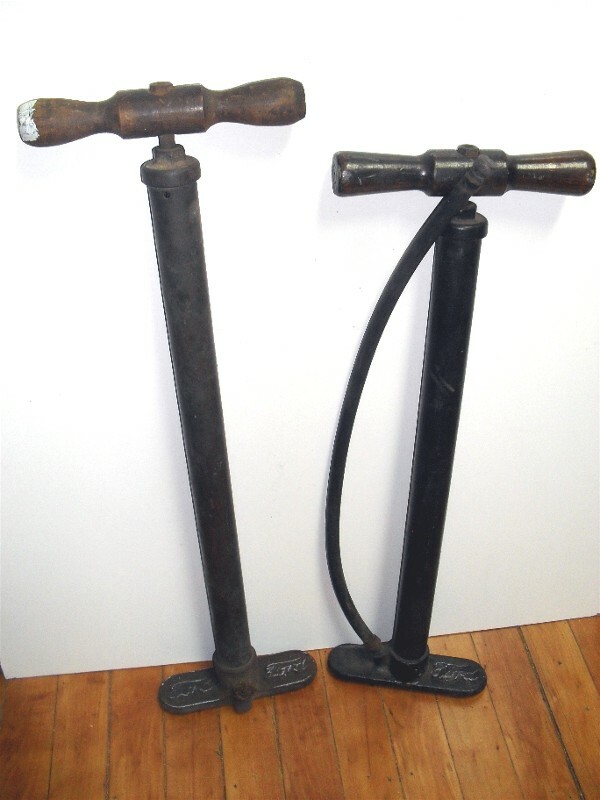 ...In 1921 Indianapolis Air Pump leaped into the national arena when (Frank) Sparks secured a contract to produce tire pumps for Ford Motor Company. 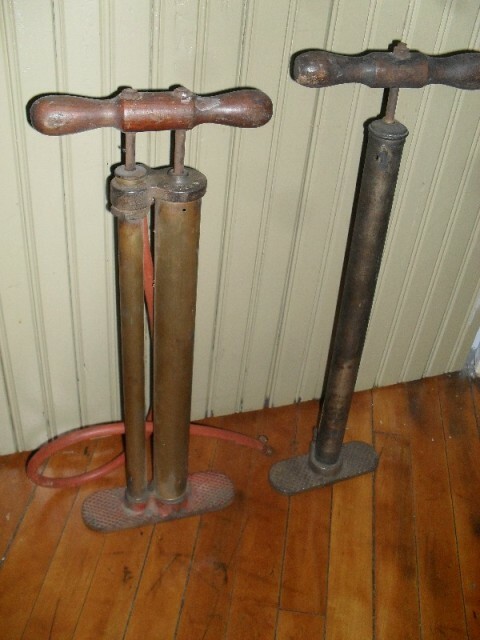 That same year the company began experimenting with a tube manufacturing process that led to a company name change in December 1921, when the partnership was incorporated as the Indianapolis Pump and Tube Company. Noblitt was named president, and Sparks was appointed secretary of the new corporation, which established headquarters in Indianapolis. Frank Sparks eventually became president of Wabash College (Crawfordsville, Indiana) and ran unsuccessfully in 1956 as the Republican candidate for governor in Indiana. Sparks appeared on "This Is Your Life" in 1953. About 8 minutes into the show, reference is made to the tire pump contracts with Ford Motor Co during the Model T era.